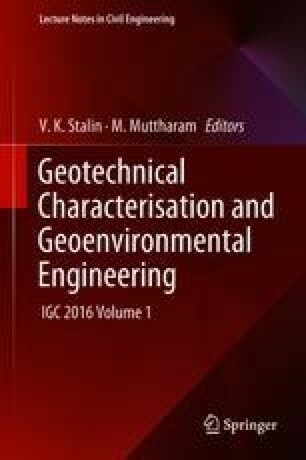 The influence of geomembrane in maintaining the sealing efficiency of a landfill cover system at the onset of flexural distress was studied by conducting a series of centrifuge tests performed at 40 gravities. The tests were performed using a 4.5 m radius beam centrifuge having a capacity of 2,500 g-kN available at IIT Bombay on model composite barriers of 0.6 m thickness. The thickness and tensile stiffness of the geomembrane were varied. All the models were instrumented with pore pressure transducers (PPTs), linear variable differential transformers (LVDTs), a digital camera and a charge-coupled device (CCD) video camera to study the performance of the barriers during centrifuge tests. The sealing efficiency of the composite barriers was found to be maintained even after the formation of full-depth cracks within 0.6 m thick clay barriers subjected to a maximum distortion level of 0.125. This observed behaviour is attributed to the downward thrust exerted by the deformed geomembrane at the zone of maximum curvature which hinders the infiltration of water through the cracks. The downward thrust exerted by the geomembrane on the clay barrier was found to be more for barriers provided with stiffer and thicker geomembrane.